On October 15, 1940, the Michael Herman opened a folk dance center in the Ukrainian National Home on East 6th Street, New York. From a weekly class, the center grew to daily classes, workshops, teacher-training courses, and festivals. They moved to Polish Dom, and finally found a building on 16th Street at 6th Avenue where they opened their soon-to-be-famous Folk Dance House. Everyone from dancer to musician was always welcome at Folk Dance House. Attendees included Burl Ives, Gene Kelly, Peter Lorre, and Damon Runyon. Michael Herman's Folk Dance Orchestra was a featured group on many of the folk dance recordings that Folk Dance House put out through Sonart Records on the Folk Dancer label, which he co-founded with Dave Rosenberg. Several hundred excellent folk and contra dance recordings were produced, frequently with Michael on violin, Mary Ann on piano, and the extraordinary Walter Erickson on accordion. 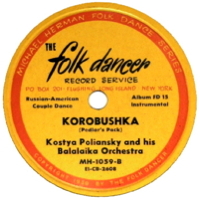 Beginning in the late 1960s, the availability of easily recorded tape cassettes brought on the destruction of the folk dance record industry, including the Folk Dancer label. Because of these feelings, he refused to sell records from his alleged stock of 50,000 Folk Dancer records for the last 20 years of his life. Since Michael's death in 1996, the Kentucky Dance Foundation has become the owner of the Folk Dancer record label, and has put the recordings out in 63 CDs. LP-110  Bulgarian Folk Songs and Dances; Bulgarian & Macedonian Folk Songs and Dances.